Bottlenose dolphins are incredible echolocators. Using just sound, they can detect a ping-pong ball sized object from 100 m away, and discriminate between objects differing in thickness by less than 1 mm. Based on what we know about man-made sonar, however, the dolphins’ sonar abilities are an enigma–simply put, they shouldn’t be as good at echolocation as they actually are. Typical manmade sonar devices achi­eve high levels of performance by using very narrow sonar beams. Creating narrow beams requires large and costly equipment. In contrast to these manmade sonars, bottlenose dolphins achieve the same levels of performance with a sonar beam that is many times wider–but how? Understanding their “sonar secret” can help lead to more sophisticated synthetic sonar devices. Bottlenose dolphins’ echolocation signals contain a wide range of frequencies. The higher frequencies propagate away from the dolphin in a narrower beam than the low frequencies do. This means the emitted sonar beam of the dolphin is frequency-dependent. Objects directly in front of the animal echo back all of the frequencies. However, as we move out of the direct line in front of the animal, there is less and less high frequency, and when the target is way off to the side, only the lower frequencies reach the target to bounce back. As shown below in Fig. 1, an object 30 degrees off the sonar beam axis has lost most of the frequencies. Figure 1. 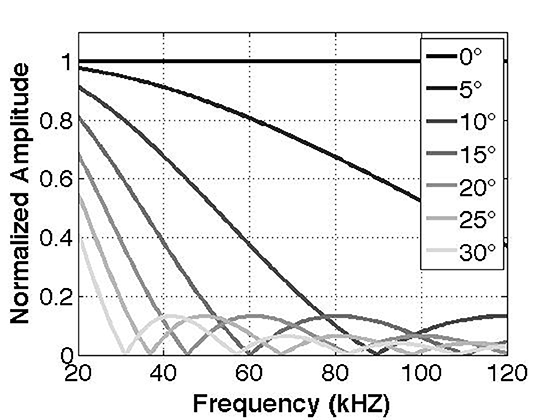 Beam pattern and normalized amplitude as a function of signal frequency and bearing angle. At 0 degrees, or on-axis, the beam contains an equal representation across all frequencies. As the bearing angle deviates from 0, however, the higher frequency components fall off rapidly. Consider an analogy to light shining through a prism. White light entering the prism contains every frequency, but the light leaving the prism at different angles contains different colors. If we moved a mirror to different angles along the light beam, it would change the color reflected as it moved through different regions of the transmitted beam. If we were very good, we could locate the mirror precisely in angle based on the color reflected. If the color changes more rapidly with angle in one region of the beam, we would be most sensitive to small changes in position at that angle, since small changes in position would create large changes in color. In mathematical terms, this region of maximum change would have the largest gradient of frequency content with respect to angle. The dolphin sonar appears to be exploiting a similar principle, only the different colors are different frequencies or pitch in the sound. Prior studies on bottlenose dolphins assumed the animal pointed its beam directly at the target, but this assumption resulted in the conclusion that the animals shouldn’t be as “good” at echolocation as they actually are. What if, instead, they use a different strategy? We hypothesized that the dolphin might be aiming their sonar so that the main axis of the beam passes next to the target, which results in the region of maximum gradient falling on the target. Our model predicts that placing the region of the beam most sensitive to change on the target will give the dolphin greatest precision in locating the object. To test our hypothesis, we trained a bottlenose dolphin to detect the presence or absence of an aluminum cylinder while we recorded the echolocation signals with a 16-element hydrophone array (Fig.2). Figure 2: Experimental setup. The dolphin detected the presence or absence of cylinders at different distances while we recorded sonar beam aim with a hydrophone array. We then measured where the dolphin directed its sonar beam in relation to the target and found the dolphin pointed its sonar beam 7.05 ± 2.88 degrees (n=1930) away from the target (Fig.3). Figure 3: Optimality in directing beam away from axis. The numbers on the emitted beam represent the attenuation in decibels relative to the sound emitted from the dolphin. The high frequency beam (red) is narrower than the blue and attenuates at angle more rapidly. The dolphin directs its sonar beam 7 degrees away from the target. To then determine if certain regions of the sonar beam provide more theoretical “information” to the dolphin, which would improve its echolocation, we applied information theory to the dolphin sonar beam. Using the weighted frequencies present in the signal, we calculated the Fisher Information for the emitted beam of a bottlenose dolphin. From our calculations we determined 95% of the maximum Fisher Information to be between 6.0 and 8.5 degrees off center, with a peak at 7.2 degrees (Fig. 4). Figure 4: The calculated Fisher Information as a function of bearing angle. The peak of the information is between 6.0 and 8.5 degrees off center, with a peak at 7.2 degrees. The result? The dolphin is using a strategy that is the mathematically optimal! By directing its sonar beam slightly askew of the target (such as a fish), the target is placed in the highest frequency gradient of the beam, allowing the dolphin to locate the target more precisely.